CND Shelac – Why is it so good? 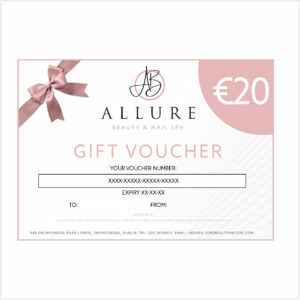 A Printable voucher that can be redeemed @ Allure Beauty & Nail Spa in Drumcondra towards Treatments or Products when presented instore. You can also send a voucher to a friend with a personalised message for them to print and present instore. Voucher may not be redeemed for cash & we will be unable to give any change via cash after redemption.